As the centerpiece of Mission Style Furniture - the Amish Mission Bed is the perfect combination of classic style and timeless beauty. Handcrafted by skilled Amish woodworkers from the finest hardwoods, this heirloom quality bed is sure to make a statement for many generations to come. Choose from eleven different hardwoods and premium finish to ensure a unique piece that will fit seamlessly into any bedroom you choose! With many different Mission Night Stands and Dressers to choose from, you're sure to find the perfect combination to build your dream bedroom! 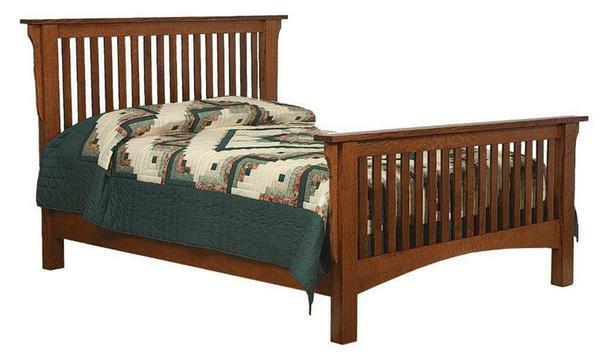 If you have any questions about this bed or would like to start your order over the phone, please call one of our experienced Amish Furniture Specialist toll-free at (866) 272-6773.